Hello crafty friends! Happy Sunday! Hope everyone’s had a fantastic weekend. I can’t believe that we’re nearing the end of summer. It’s only a handful of days until the start of fall & the pumpkin spice madness begins. Fall is my absolute favorite time of year so I’m excited for the cool nights, leaves changing colors and snuggly sweater weather. Today I’m popping in to share something magical. I love when I’m playing with my craft supplies and I accidentally create something beautiful. This card I’m sharing today came about because of my playing with the Tattered Angels Glimmer Mists I received as part of the D2BA & CCB collaborative blog hop we had a couple of weeks ago. I was testing out the glimmer spray and using some stencils to see how they would work. I had this sort of clam shell stencil and thought I’d see what it would look like when I sprayed my Vintage Pink & Sun Sisters yellow glimmer mists across it. I never expect much when it comes to stencils because sometimes they look great and other times they end up looking like a muddy mess because your mediums mix and blend underneath the stencil area. This just happened to be one of those times that it worked out. The result was a gorgeous mix of pink and yellow shimmer in some places and in others, the two colors blended beautifully to make a really pretty orange color. Taking the stencil away from my cardstock, the end result looked a bit like scales and that’s when I knew exactly what project I wanted to use this background on. I teased this picture on Facebook earlier this week. I’m sharing it again here so you can really see the shimmer in the background. It’s harder to see in my other pictures due to my light box that I use for photographing my cards. Does anyone else ever do that? Create a happy accident and use it for the starting point of a card or project? Love it when inspiration comes that easily and while having fun. I have this adorable, and I really mean adorable; stamp set from My Favorite Things called Magical Dragons. When this set was released by My Favorite Things recently, I was in love. There are a total of 17 stamps in the set – 4 of which are these adorable dragons. Then there’s a little knight in shining armor and a little princess and a whole bunch of cute sentiments to go along with the images. 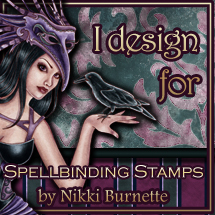 I picked out one of the dragons and colored it up shortly after my stamps came in the mail. I could have colored it with my Copic markers, but decided to use colored pencils which would give it a softer look. I used a combination of my Prismacolor pencils and some new Staedtler colored pencils; I picked up super cheap at Walmart. Coloring with pencils takes much more patience, I think as it takes a while to build up layers and depth with colored pencils. I don’t really have the best paper for using colored pencils since you’re supposed to use paper that’s made for pencils that has a tooth to it. For my dragon, I just used my Neenah Solar White cardstock. That’s the reason why my dragon is a bit softer color – lack of tooth in the Neenah paper doesn’t allow me to build up color. In the end I liked the softer colors so it worked out this time. When I finished coloring the little dragon, I added some spots to his skin to give him some additional depth and texture. I really love the color combo of the purple and the light greenish/blue. Probably not a normal color for a dragon, but hey it’s my fairy tale and dragons can be any color the artist chooses, right? At this point, I had die cut my background with a stitched rectangle die and I started to work on my clouds. I have these awesome stitched cloud dies from Lawn Fawn so it creates these big fluffy clouds. I’d cut them with some more of my Neenah solar white cardstock. Originally, I thought that the bright white clouds would be a good contrast, but decided that they were too white and I sponged on a little distress ink until they took on a blueish-pink color with just a hint of yellow – like the sun could be hiding behind them. I really like how they turned out. I added the sentiment, You Make My Life MAGICAL with some Versamark ink and I sprinkled on some Lindy’s Stamp Gang embossing powder in Hydrangea Blue Mauve. I love the Lindy’s embossing powders because they take on this iridescent color when they’re heat set. This one looks almost like a purple-blue color. It’s very cool! Once I was finished, I laid out all of my elements to see how the card would look. I decided that it needed one more thing at the last-minute, a princess. I stamped and colored the little princess from the set and colored it with my colored pencils as well. I used the same colors for her dress as I’d used on the dragon. I used some yellow to color her crown, but that didn’t seem adequate for royalty so I used my Spectrum Noir Sparkle pen in Spun gold to color in the crown. Hope you enjoyed my magical card today! I’ll be back on the 4th of September with an upcoming challenge card for Dare 2B Artzy! It’s a birthday challenge so all you crafty peeps with fall/winter birthday’s (like me) have some inspiration to look forward to on the 4th. Hope everyone has a great week! Make it a crafty one! ← All You Need is Love!